Black budget book. The mass producer Acer packs a current Pentium quad-core in one of its tried but also boring standard casings, and it demands prices starting as low as 350 Euros (~$483). Will saving here prove to be an agony, or is the speed and ergonomics enough for everyday tasks? Our review sample is aimed at newcomers and office users with low requirements on screen and performance. It sports an Intel Pentium N3520 (4x 2.167 - 2.42 MHz, no Hyper-Threading, TDP: 7.5 W) alongside the integrated HD graphics without a dedicated memory and a conventional 500 GB HDD. Many contenders with a similar configuration and performance are found in the price range of around 400 Euros (~$552). For example, HP's 250 G2 which, like Acer's E1-510, relies on a Pentium, but the slower N3510 model (4x 2 GHz, TDP: 7.5 W), or Toshiba's Satellite C50D-A-10E with AMD's A4-5000 APU (4x 1.5 GHz, no Hyper-Threading, TDP: 15 W) that is based on the competing Kabini platform and integrates the HD 8330 graphics unit. We used the benchmarks of both contenders for comparison. We have encountered the review sample's casing in various, identically built and looking models of Acer's E1-572G, such as the E1-572G-54204G50Mnkk. Therefore we will not go in-depth about casing, connectivity, input devices, and speakers in this report. The E1-510 screen's 1366x768 pixels distributed over 15.6-inches result in a pixel density of just 100 ppi, which is roughly the rate that a 22-inch desktop screen with a Full HD resolution achieves. It is barely possible to find less nowadays, and thus single pixels and the grid are visible when looking at the screen from a close distance. Fonts could be finer, and there is not much room for very many elements on the desktop either. We would say that the image sharpness is acceptable. This was also to be expected in view of the price: Acer's laptop does not quite reach an average brightness of 200 cd/m², which often marks the boundary of useful and useless for outdoor use. The black level of 0.49 cd/m² is sufficient. Since the contrast is relative to the black level and maximum brightness, the review sample only achieves a fairly moderate 392:1. These rates are common for 400 Euros (~$552) laptops. The viewing-angle stability is poor even for a TN screen. Every movement in front of the screen causes the usual image distortions. Pale is the right word for the color reproduction, which is everything but ideal, with a DeltaE rate of almost 10 in both Grayscale and ColorChecker. This leads to the common, extreme bluish cast. Matte or not, working comfortably outdoors is only possible under completely overcast skies just because of the low brightness. The TDP of Intel's Pentium N3520 SoC of only 7.5 watts indicates extremely low power consumption and easy-to-manage temperatures, but it also involves the corresponding weak performance. Although it is now far remote from sluggish models, such as the infamous Intel Atom N270, alongside other Bay Trail M SoCs it is currently the bottom-of-the-barrel of today's available x64 processors. The E1-510 manages routine office tasks without massive delays, and even Full HD videos can be enjoyed smoothly (on an external monitor) due to the hardware-based video decoding. But it does not manage much more. Intel's Pentium N3520 has 4 physical cores with a very limited per-MHz performance and does not feature Hyper-Threading. 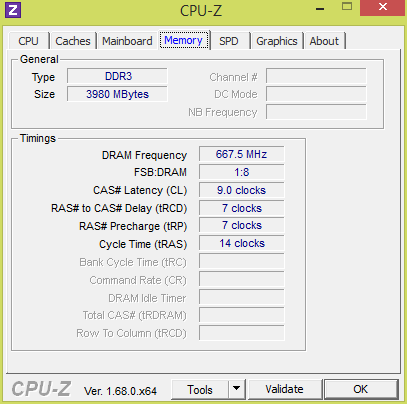 The base clock of approximately 2.2 GHz can be increased up to 2.4 GHz via Turbo. Unlike the competing APUs from AMD's Kabini platform, such as the A4-5000 (4x 1.5 GHz, TDP: 15 W), the Pentium achieves a small advantage of 15% in the pure CPU performance (Cinebench R11.5 Multi-CPU). 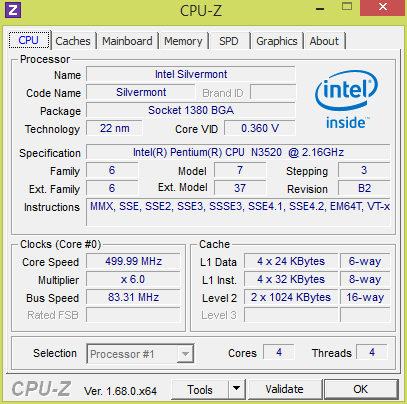 The performance plus is also approximately 15% compared with the Pentium N3510 (4x 2 GHz, no Turbo, TDP: 7.5 W), like in HP's 250 G2 (F0Z00EA). Toshiba's Satellite C50-A-1JU with the same SoC runs just as fast. We would have been extremely surprised about throttling, but the Turbo speed was maintained stably even during longer full load. 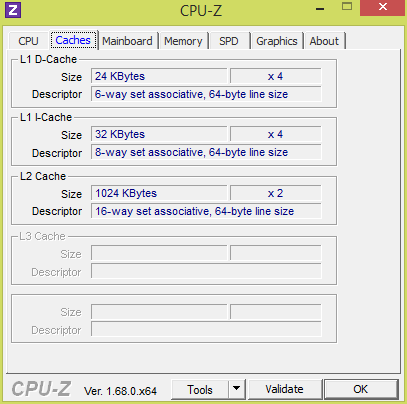 The system's performance primarily depends on the CPU/GPU and hard drive. PCMark 8 assesses this performance via typical application scenarios that are simulated synthetically ("Home," "Creativity," etc.). We compared Acer's E1-510-35204G50Dnkk with current office laptops, and found it at the lowest end of the spectrum as expected. However, single systems based on AMD's A4-5000 still perform 10 to 20% worse. Usage is smooth when using software with low hardware requirements, and the laptop is mainly used for browsing. Nevertheless, minor differences compared with devices that sport the considerably faster Intel Core i5-4200U, which is frequently found in 600 Euros (~$828) laptops, are noticed. The performance would also be boosted more significantly by using an SSD, which is not installed anywhere in this price range. Working with image-editing software, such as Adobe Photoshop Lightroom, is very sluggish. The 500 GB Scorpio Blue WD5000LPVX hard drive from Western Digital that spins with 5400 rpm is installed in our review sample. The HDD achieved a decent sequential read rate of 102 MB/s in CrystalDiskMark 3.0. However, it is not enough for top rates because of the HDD's typically low performance in reading small random data blocks (Read 4k). Although it is good on average compared with other 5400 rpm HDDs, it does not even come close to rates of around 20 MB/s that an SSD would achieve. 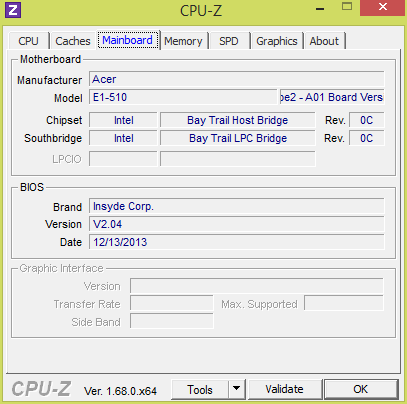 The CPU-integrated Intel HD Graphics (Bay Trail) is a very weak graphics core for a laptop. Its performance just achieves the performance of a Sandy Bridge Intel HD Graphics from the before last CPU generation and is on par with Nvidia's mobile Tegra 4 SoC that is mainly used in Android smartphones and tablets. As can be seen in the results of the 3DMark (2013) Ice Storm benchmark, the HD 8330 in the Satellite outperforms the review sample's pure graphics performance by 50%, which can then again benefit from its higher processing power in the CPU-heavy Physics test. StarCraft 2's relatively low hardware requirements were striking in its release year of 2010. 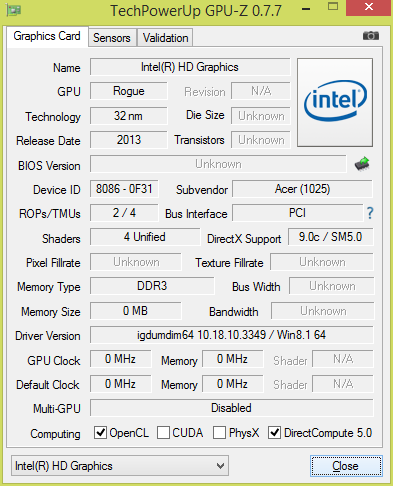 Nevertheless, Acer's E1-510-35204G50Dnkk only managed a smooth 49 fps in the minimum settings using 1024x768 pixels. With this background we did not even have to try Diablo III, which is also rather modest. Thus, 3D shooters that are younger than 8 years will not at all be possible. Examples of what would be thinkable in the lowest settings are World of Warcraft or Torchlight 2 from 2012 as an alternative to Diablo III. Users who want a wider spectrum of games but are not willing to pay more, are better off with Kabini laptops. At least FIFA 2014 (up to high! ), Diablo III, and Anno 2070 (both minimum) usually run smoothly here. Hushed - the fan in our Aspire can only be discerned from the usual ambient noise when approaching the laptop with an ear even during load. HP's 250 G2 with the only marginally slower Intel Pentium N3510 completely omits an active-cooling solution. We did not at all notice the hard drive in our review sample, which corresponds with our measurements. The keyboard was unobtrusive as well - when disregarding the slight clattering noise of the larger keys, such as space. The absolutely uncritical temperatures of a maximum 35 °C (load, upper side, center) at all times do not require closer analysis - the chart below speaks for itself. The small amount of produced waste heat is discharged from the casing's side so that the device can be used on the lap without restrictions. (+) The maximum temperature on the upper side is 34.9 °C / 95 F, compared to the average of 33.9 °C / 93 F, ranging from 21.2 to 62.5 °C for the class Office. Fortunately, the power consumption of 0.1 watts in a turned off state, and 0.2 watts in idle is hardly worth mentioning. The average idle consumption of all 15.6-inch laptops from the last twelve months is 11 watts. The Aspire looks good here with 8.2 watts. Acer's laptop is among the most energy-efficient devices in this field during load, which is no surprise in view of the hardware. The weak 37 Wh battery unfortunately thwarts any hopes for extremely long battery runtimes that may have evolved from the low power consumption. The review sample still managed 5 hours in our practical Wi-Fi test, using a screen brightness of approximately 150 cd/m², enabled energy-saving mode, and representative, selected websites opened in regular intervals. That is completely acceptable for the capacity. The lighter Toshiba C50D-A-10E lasts longer: Owing to its 48 Wh battery, it clearly outperforms both HP's laptop and the review sample, with seven hours. 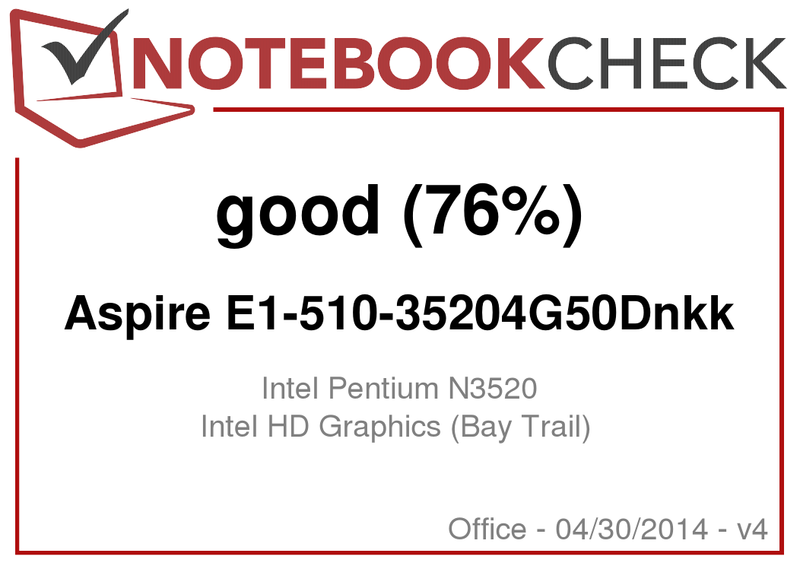 Acer's Aspire E1-510-35204G50Dnkk proved to be an unobtrusive companion in a positive sense in the test. The standard casing is well built and solid but is not exciting due to its omnipresent plastic looks. The input devices do not give much reason for complaint, and although the connectivity is modest, it includes all the essentials as expected from a device from this price range. Also as expected, Acer dug out the screen from the bottom-most drawer. Even office workers actually want some room to move when working in front of the screen without having to accept visible drawbacks in the presentation - but this unfortunately is almost the case here. However, a certain capacity for suffering has apparently developed among budget buyers in this respect because complaints are rarely heard from owners of these laptops. The Aspire E1-510's system performance is low but sufficient for the targeted application scenario. The device does not manage to smoothly cope with more than basic tasks, such as browsing and working with office suites. Buyers who want more graphics power with the same CPU in a price range of around 400 Euros (~$552) should look around for laptops based on AMD's Kabini platform. For example, the A4-5000 has a twice as high TDP as the N-Pentiums, but it does not result in halved runtimes or doubled power consumption. Quiet, and good battery runtimes for the money. Surfaces that do not attract fingerprints. Are they too expensive? A few years ago, we would have had to be satisfied with lame, 10.1-inch Atom netbooks for this price. Even the low-cost M-Pentiums and Kabini APUs fully contradict that.